No one can doubt that Nokia is determined to mark out some serious mobile music territory for itself, what with its recent N81 and N95 8GB-packing smartphone releases, and a series of high profile music service announcements (including Nokia Music Store and its Comes With Music). At the same time, it's turned its attention to lower down the handset range, too, by refreshing its XpressMusic music phone portfolio. The 5310 XpressMusic is one of a pair of affordable newcomers to the loud and proud - if low-key - XpressMusic line. Whereas Sony Ericsson seemingly has a new Walkman phone every few weeks, reinforcing its mobile music branding, Nokia's so far taken a relatively sedate approach to releasing music-optimised XpressMusic-tagged phones. The 5310 XpressMusic aims to hit its target youth-market with a slick slimline look, featuring prominent colour contrast music player controls, and plenty of tune-playing punch; Nokia supplies the 5310 with a 2GB MicroSD card in-box to supplement its modest 30MB internal storage. And at a pre-pay price that's initially pitched around the £120-£130 mark, this is a phone that is going to grab attention with its price-tag too. The Nokia 5310 XpressMusic doesn't have 3G built in for fast over the air downloading - it makes do with quad-band GPRS - although Nokia has included a few useful Web-based apps. The 5310 is also light on the snapping front, with a rather basic 2-megapixel camera on the back that makes do without autofocus or flash. Music, though, is of course the headline act on the 5310. Complementing Nokia's restyled music and video player inside, there's an FM radio, plus Nokia has slipped in a 3.5mm headphone jack, enabling users to upgrade headphones easily from the supplied pair. A set of three large music player keys are ranged down the side of the display on coloured aluminium side panels - red or blue - that set off strikingly against the rest of the black and graphite grey bodywork. That chassis is just 9.9mm thin, and with a weight of just 71g this candybar feels suitably light in the hand and comfortable in the pocket - unlike some of Nokia's earlier, chunky XpressMusic handsets. The numberpad keys are a bit plasticky, but are large enough, arranged in a straightforward grid, and slightly curved to make them suitable for no-fuss texting. The display is a 2-inch QVGA (240x320 pixels), capable of showing up to 16.7 million separate colours; it's not the biggest array, but it is bright and vivid. Nokia has unsurprisingly used its standard Series 40 user interface on this model, and the navigation controls are a familiar set of buttons arranged around a central D-pad. A pair of softkeys flank it, while there are standard call and end keys beneath these. The D-pad and softkeys can offer shortcuts to a range of features. They arrive pre-set, but it's simple to reconfigure them to your own tastes. Similarly, out of the box, the standby screen is set for Active Standby, with a quintet of icons lines up on a bar at the top of the display for shortcuts to functions. Other fast access options - like music player and radio, and calendar reminders, are listed down the screen. You can re-set all of this too to suit your own requirements. That makes for a flexible and quick menu access set-up - although you can choose simply to hit the central menu option and delve through the options from a standard grid format. The conspicuous music player controls with their diamond etched music symbols look good on the 5310 XpressMusic and trumpet what this phone majors on. Get the music player or radio in motion, and you can control the tunes - play, pause, forward or reverse - even when the music is strutting its stuff in the background. With 2GB of track-space to play with out of the box (thanks to the supplied MicroSD card) you can get hundreds of tunes onto the 5310 before you even consider adding further cards (it can accommodate up to 4GB capacity MicroSDs). The music player user interface is similar to that used on other recent Nokia's latest Series 40 models, though you can tweak the themes on the 5310's player with additional skins. The player supports MP3, MP4, AAC, eAAc+, and WMA music file formats, and tracks are organised in familiar MP3 player style - by playlists, artists, albums, genres, and there's a video option. Cover art can be copied over to the phone too. 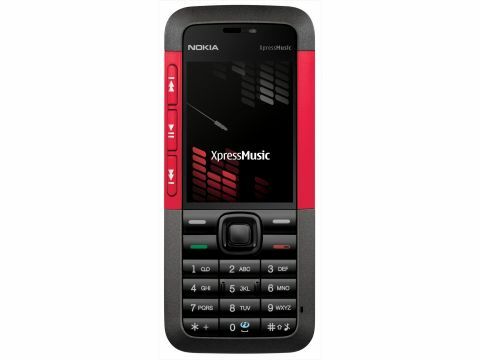 For any music player, good sound quality is the key requirement, and the 5310 XpressMusic gets this spot on. It produces a superb sound performance; the supplied headset is decent enough to be getting on with, but try plugging in some good quality headphones and you get a lovely, rich sound with tonal subtlety as well as plenty of bass. It's a fine player. You can adjust equaliser settings if you want to optimise your istening pleasure. You can use the built in speaker, too, which is OKish, but isn't a treat to the ears. Stereo Bluetooth on board means you can stream tunes to wireless headphones or speakers too. Nokia supplies its PC Suite software and a USB cable to sync and manage your music via a PC, though another option is drag and dropping music files straight to the phone in mass storage mode. The FM radio adds another free entertainment option, with the music player controls neatly coming into play for this function too. One less favourable aspect of the Nokia 5310 XpressMusic is its rather basic 2-megapixel camera. For a lower-end music phone like this you may not expect a high quality shooter, and images aren't brilliant. It can take reasonable shots in decent lighting conditions, but overall colours are subdued, and no flash means it struggles in low light conditions. The lack of autofocus limits the detail you can get in close up shots. It has a zoom, but this reduces picture quality further. The video recording capability is limited to low resolution (176x144 pixels) shooting, so is pretty poor played back on a PC screen. Without 3G, browsing the internet isn't one of the highlights of the 5310. However, there are a few useful web-based applications included by Nokia to make the most of the phone's internet capabilities. These include an Opera Mini browser app to go with standard Nokia XHTML browser, Yahoo! Go mobile software - which presents a suite of applications and information services in a widget-style homepage - and there's an app to download the Nokia WidSets customisable widgets application. The Opera Mini browser is optimised for rendering web pages for small mobile displays, and does an able job in producing reformatted pages in easy scrollable format relatively speedily for a 2.5G phone. The Yahoo! Go and WidSets apps - although available as downloadable apps - are a smart addition, as they enable users to get regular updates on blogs, web-based information services and favourite websites without having to fire up the browser each time, and spend ages surfing from site to site. The 5310 covers the usual Nokia bases in terms of email support and organiser options; calendar, contacts and notes can by synced with a PC using Nokia PC Suite software. Voice recording and voice control options are available too. Alongside an internet Search app and functional Convertor software, Nokia has included a couple of apps to please to the younger mobile demographic - a cash-saving fractals-based abstract wallpaper creator, and Nokia's Sensor Bluetooth-operated short-range social networking application that can plug you into similar Sensor users within a 10 metre radius. Three games are provided too, City Bloxx, Snake III, and Music Guess (a quiz based on your own tunes). At its base level phone functionality, call quality was impressive, with no audio problems - sound was clear and loud at both ends. In terms of battery life, Nokia claims the 5310 XpressMusic can keep playing tunes for up to 20 hours solid, which is a decent amount of play-time for a slimline music mobile. In ordinary phone usage scenarios, Nokia quotes battery life at up to 5.4 hours talktime or 300 hours in standby; not the longest for a non-3G handset, but it should keep you going for a fair amount of time between charges. We were able to go 4-5 days between charges with moderate usage, but we'd guess those who are attracted for its tune-playing prowess will be caning the music player, and so wil have to charge more frequently. The music player is, after all, the central feature of what is a decent budget priced handset. The camera may be somewhat underwhelming, and the 5310 lacks 3G for fast tune downloading and surfing. But it comes with a generous amount of MicroSD memory in-box and a great music player that lives up to its top billing. For a music phone at this price the 5310 XpressMusic is enticingly slim and eye-catching enough to distinguish it from the crowd, while its fine audio performance certainly makes it stand out too. * A detailed specification of the Nokia 5310 XpressMusic can be found on the Nokia website.